Talk about a heavenly dessert: Cool Whip, sweet strawberries and tender angel food cake come together in a cloud-like confection. 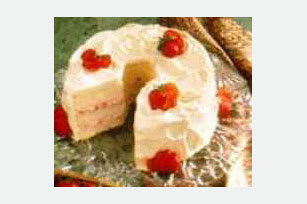 Trim 1.5 grams of fat per serving by preparing with COOL WHIP LITE Whipped Topping. With sharp knife, cut whole strawberries into thin slices, cutting up to, but not through, stem ends. Hold stem end in place and gently fan out slices from stem.